Healthy and beautiful skin is every woman’s dream. A glowing skin with absolutely no aid from makeup, it sounds a bit unbelievable, right? Surely all of you would’ve familiarized yourselves with a face mask. The face mask is predominantly used to refine our face. It is an essential part of one’s periodic facial care made from various materials with their respective advantages. The variety of face masks depend on what skin type and skin problem one has. A few examples such as face mask for dry skin that aims to help hydrate and restore skin moisture, or vitamin mask to help brighten dull skin. Important to note, though, a face mask should be not used every day—just 1-2 times each week is enough to do the job. 24K Gold Collagen Mask is a highly recommended gold facial mask. This face mask is suitable for all skin types, so no matter what skin type you have, you can use this face mask and get the benefit of gold collagen. The ingredient of this facial mask has been carefully selected so that it is suitable for all skin types. 24K Gold Collagen Mask has the main effect in reducing the appearance of existing signs of aging and helping prevent future wrinkles. 24K Gold Collagen Mask contains ingredients that are highly effective to penetrate deeply into the skin layers and boosts rejuvenation on a cellular level. Some of the unique and stellar ingredients in this mask include gold, aloe extract, collagen, hyaluronic acid, and rosa rugosa flower. As the name of this mask implies, gold is the star ingredient in this mask. This is because gold benefits have been proven time and again in preventing signs of premature aging through slowing down collagen depletion, increasing skin elasticity, lightening the complexion and stimulating the cells by increasing blood circulation. Furthermore, gold facial treatment is beneficial to tighten the skin and facilitate the removal of toxins. While you let the gold work for your skin, there is aloe extract that serves as an anti-inflammatory agent and overall hydrating ingredient to help your skin heal while hydrating and calming. Aside from gold as the primary ingredient, there is collagen which is a key ingredient to ensure your skin stays smooth and supple—it is what helps the skin maintain its elasticity and firmness. The combination of active gold and collagen has repairing properties that help to reduce the appearance of wrinkles, puffiness and dark circles under the eyes. Other than that, there is hyaluronic acid for skin-replenishing and skin-restoring—plus, it is also excellent at defending your skin against moisture loss. And lastly, the final ingredient is rosa rugosa flower. Its oil is effective in fighting acne and any infections that may cause your skin to break out. All these ingredients are mixed into one mask that will work wonders on your skin. 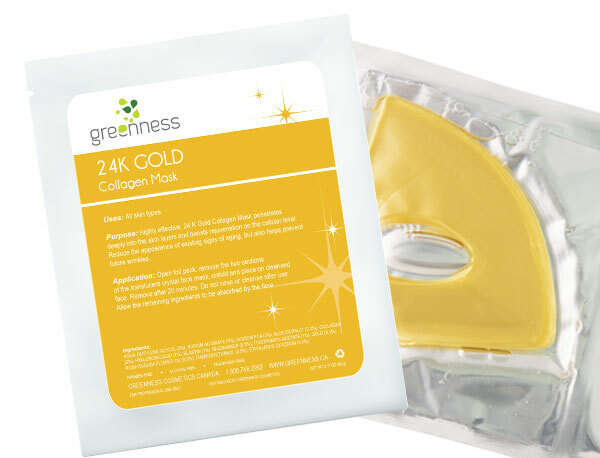 This 24K Gold Collage Mask is available at Greenness Shop.